The Laffer Curve—the conceptual device illustrating how high marginal tax rates reduced revenue and economic growth—helped revolutionize tax policy around the world thirty five years ago. Every advanced nation followed the United States in lowering tax rates on income (both personal and corporate) and capital investment in the 1980s; many did so more vigorously than we did. 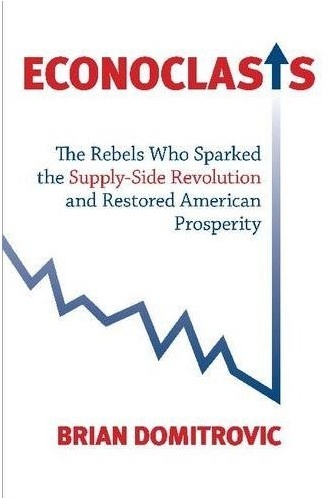 (The definitive treatment of the subject is Brian Domitrovic’s Econoclasts. Belongs on everyone’s economics bookshelf.) While the Left kvetches against the Laffer Curve, I note that not even the most leftist governments in the industrialized world propose restoring pre-Laffer Curve income and capital gains tax rates. Game over. Newsome says the study for deepening Savannah’s harbor was made in 1999. It is 2012, and studies for the environmental impact statement are not finished. When they are, the project will take five years to construct. “But before that,” he says laconically, “they’re going to be sued by groups concerned about the environmental impact.” A Newsome axiom — that institutions become risk-averse as they get challenged — is increasingly pertinent as America changes from a nation that celebrated getting things done to a nation that celebrates people and groups who prevent things from being done. . .
Here’s where we need the regulatory equivalent of the Laffer Curve. Take the Keystone pipeline as an example. The pipeline is likely to be approved eventually, but only after more years of review and litigation. Certainly measures will need to be taken to reduce the environmental risks of the pipeline, but is there any safety measure that we will eventually impose that we didn’t recognize in the first six months of the review process? It’s not like we’ve never built a pipeline before, or learned from previous pipeline accidents (like the one in Montana last summer). Are there really any potential environmental impacts of deepening a harbor in South Carolina by five feet that require six to ten years of review and litigation, and a three-thousand page Environmental Impact Statement? Clearly the review process we have now is largely deadweight loss, just as high marginal tax rates discouraged capital formation, investment, and productivity improvements in the high-inflation 1970s. We can arguably afford the extravagance of regulatory suffocation when the economy is booming at 4 percent growth a year or better (as in the late 1990s) and unemployment is 5 percent. We cannot afford it under the current stagnant circumstances. A Laffer Curve for regulation will explore just how much economic growth and how many jobs were are sacrificing for this artificial punctiliousness. What needs to be done? The regulatory review process ought to have a short deadline. Agency review should be completed within six or nine months, with a presumption in favor of granting permission unless an agency can delineate a substantively new problem based on precedents from previous similar projects (that is, no speculative objections based on what global warming might do 75 years from now, as actually happened to a proposed project in California a few years back where regulators denied a building permit on the theory that rising sea levels would make the land habitat for an endangered species that would want to move upland). Standing to sue to block projects should be tightened, and the threshold for hearing such suits made much more restrictive. And how about requiring that all Environmental Impact Statements be no longer than 200 pages? I’m sure all the environmental lawyers and consultants who charge by the hour and make a bundle doing these multi-volume EIRs that no one reads will howl, but if the Supreme Court can limit briefs to 50 pages on matters of high constitutional importance, why can’t our regulatory process not emulate a standard of brevity that emphasizes the essential over the frivolous and tedious?